An Arizona take on the ESPN speculation. Waynes is younger and playing very well. I'm good on that. Rhodes is fine...He's always fine. He never misses time. I felt he kinda sold that play he got injured on because their feet got tangled and he wanted to oversell that idea so much as so not to draw the PI penalty. Probably looking to deeply into that, but Rhodes does this...Looks like he gets hurt and will be out, but trots on the field the very next series. The only difference this time is the game was well in hand and he really didn't need to. I'm fairly certain he's fine. And even if he did sprain his ankle, he's one of the toughest dudes around. Non-issue. Don't get me wrong, i think this idea of us picking up Peterson is nonsense. However, i just wanted to share my view on Rhodes. For me, he's not even close to being "one of the toughest dudes around", and here's why. Ever since season 1, Rhodes seems to have this go to play, where he has a niggling injury every time he gets owned on the field. Luckily these days it isn't very often. However, when he does this, its glaring to see. For example, the NFC Divisional game against the Saints. He was burnt more than once by Michael Thomas (no shame there, he's a great receiver). However, the only person i think that was judging him on his play, was himself. Suddenly gets cramp, has to hobble off. The next week NFC Championship, he must of been mentally unprepared after his 'bad showing' (wasn't that bad) the week before, and got beat multiple times by Alshon Jeffery (Rhodes had a great game against the Jeffery this season 2 recs 39 yrds no TD's). He always seems to disappear when things aren't going his way, and not just in the examples i gave. There is no corner in this game that is more physical i agree on that. Physically his very strong. But Xavier Rhodes' worst enemy, is himself. For me, he's the best corner in the game. Better than Peterson IMO, but he's nowhere near as consistent as him. For me, that's down to whats going on between his ears. I have a feeling banged up Rhodes may struggle Sunday. Because of the ankle yes, but also because he already has an excuse. Arizona would send Peterson to the Vikings for cornerback Trae Waynes, plus 2019 first- and third-round picks, with the Cardinals agreeing to keep Sam Bradford on their roster so that Minnesota will remain eligible for a 2019 third-round compensatory pick that would otherwise vanish. I think that's too much. I wouldn't do it. PP is one of the better CB's in the league. I think we should take the chance or at least consider possibly getting him if he's on the market. Its a passing league especially more now this year and we could use every matchup advantage we could get. He and Waynes seem to get picked up a lot. They are both fairly physical but still... I see what you are saying about Rhodes. Patrick Peterson is in his 8th season. He's still fairly young (28 years old), 6'1" and 203 pounds. In his 8 seasons, Peterson has 23 INTs for an average of just under 3 per year, 333 tackles (42 per year), 74 passes defensed (9 per year). He's also notched 3 sacks over that time and 33 assisted tackles. Waynes is in his 4th season, so he's younger (26 years old), 6'0" and 190 pounds. In his 4 seasons, Waynes has 6 INTs for an average of 1.5 per year, 137 tackes (34 per year), 33 passes defensed (8 per year). He also has 1 sack and 24 assisted tackles. The question for a trade that involves giving up Waynes is, how much better is Peterson? What should the Vikings be willing to trade for the marginal improvement they are likely to get for a trade like that suggested? What is a doubling of INTs, another 8 tackles, and one more pass defense worth? Also, how much of that marginal statistical difference is a product of the individual athlete versus the scheme in which that athlete plays? Look at Danielle Hunter as a good example of that question. Coming out of college, Hunter had fairly low sack totals, yet he's become a sack master in the NFL who I think is tied for the league lead in sacks right now. When asked about this apparent improvement, Hunter basically said that in college, LSU defensive linemen primarily played the run. The talent to do more was always there, but the scheme didn't emphasize it. Finally, what is a disgruntled player worth? The Cards have him locked up in a long term deal he signed. He's an important part of their team and their plans. 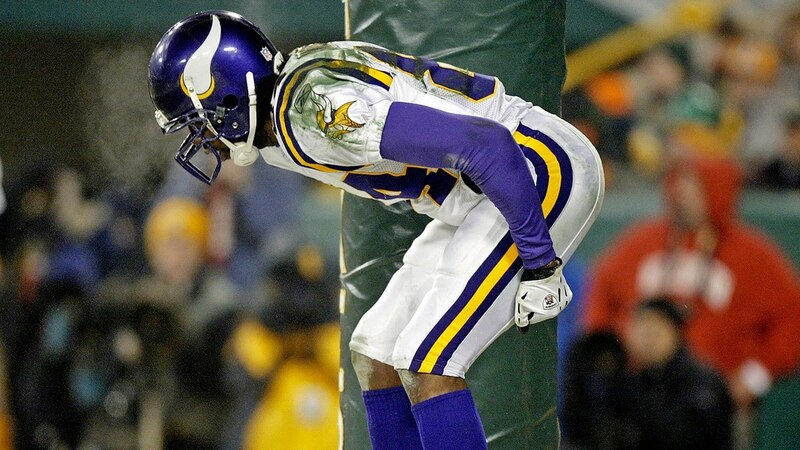 He apparently wants out because he's frustrated, but what if the Vikings trade for him and then things go south here? Is he going to be a guy who picks it up and shows leadership to get things back on track for himself and his team, or is he going to sulk and start looking for a way out? I think this knocks his value back a bit. I think it's pretty obvious it's not worth a 1st round pick, no matter how low that pick might end up being in the 1st round. No way. I'd put that marginal improvement as worth maybe a 5th rounder. Giving up an additional 3rd rounder is straight up insane, and that also assumes Peterson would continue to perform the same in a different defensive scheme that might not emphasize as much aggressiveness on the ball. Peterson is most likely stuck with the Cards and the contract he signed. His best play is to do what he can to make things better in Arizona. The Cardinals will not let him go unless they get an out-sized offer for him, and I don't see Rick making an offer like that. The Vikings have already invested way too many high picks in their secondary, and most of them are playing pretty well. Tate to the Eagles and D. Thomas to the Texans. Seems like a lot going on and it may continue throughout the day. Has anyone heard any rumors for us making a move? I agree with most of you that a 1st round pick and Waynes is a bit much for Peterson. I would probably go as high as a 3rd and a 6th with Waynes. Guess we'll see if we make any moves soon, but if we do, at least it will match up fairly decent for our bye week (not to mention we don't have to worry about Tate anymore this week).